Employees in failing relationships cost employers billions of dollars every year. These employees are more likely to experience high levels of stress, anxiety, and depression. They take more sick days. They are more distracted at work, have lower productivity, and the effects of their struggles can weigh down their team and even the entire company. An employees personal relationships have a greater impact on their emotional well-being, overall happiness, and productivity than anything else... yet few companies make any real investment into their employees emotional and relational health. Instead companies invest in 401k matching, gym reimbursements, foosball tables, snacks in the breakroom, food trucks and office parties to build a happy and productive company culture. But what culture really boils down to is relationships. If you want a workforce full of happy, hard-working, engaged employees who know how to communicate, navigate conflict, and contribute to a team, there's nothing better you can do than invest in helping them develop the skills needed for healthy relationships. Not only will these skills benefit their home life, but they'll translate over into the workplace as well! "The quality of your relationships = the quality of your life." The cost of the divorce of one employee making roughly $60k per year is estimated at over $86k in lost productivity - and that's not counting the cost of mistakes, or potential profits due to the lost productivity. You might be thinking, "But we have an Employee Assistance Program..." That's awesome! But an EAP is typically used by people who are already in relationship distress. What are you doing to help PREVENT your employees from ever getting to the place where they want to go through the horrific process of divorce? If you want to take the first step to investing in the emotional and relational health of your employees, give us your email address and we'll send you a guide that will help you calculate how much your business loses every time an employee goes through a divorce. 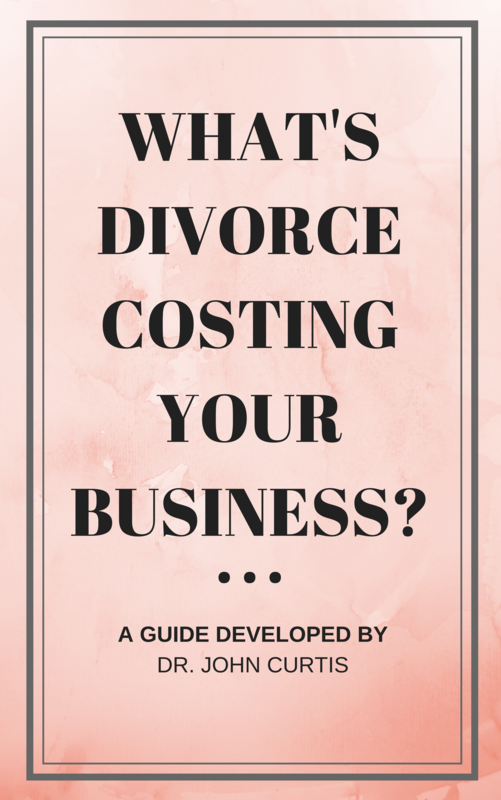 What's Divorce Costing Your Business? Download a free worksheet that will help you calculate the cost of one of your employees going through a divorce. Forthofer, M., Markman, H., Cox, M., Stanley, S., & Kessler, R. (1996). Associations between marital distress and work loss in a national sample. Journal of Marriage & Family, vol 58, 597-605. Goetzl, R., Juday, T., & Ozminkowski, R. (1999). “A systematic review of return on investment (ROI) studies of corporate health and productivity management initiatives.” AWHP’s Worksite Health, summer, pp. 12-21. Schramm, D. (2006). “Individual and social costs of divorce in Utah.” Journal of Family & Economic Issues, 27, 1-15. Stewart, W., Ricci, J., Chee, E., Hahn, S., & Morganstein, D. (2003). “Cost of lost productive work time among US workers with depression.” Journal of the American Medical Association, 289, 3135-3134. Velasquez-Manoff, M. (April 19, 2005). “Workplace stress: A $300 billion problem for American business.” Columbia News Service, Columbia University, New York. Wilbert, Lauren. (2006). “Proactive healthcare: disease management grows in popularity, specialization” Minneapolis-St. Paul Business Journal, 24, 13-14. Curtis, J. (2006). The Business of Love. IOD Press: Florida. Fagan, P., & Rector, R. (2000). The Effects of Divorce in America. Heritage Foundation.